As, yeah, it was a truly miserable day - as I decided to gut it out and sit in a myriad of rain showers/squalls in my cheesy Chiquita banana yellow paper thin raingear, noting that I hadn’t been that miserably wet ‘N co-oooolllldddd in years... Feeling very sorry for the drivers by denoting what a YUCKY day to be out racing; Err, trying to race! What a miserable-miserable-miserable day, albeit feeling that after the euphoria of the prior day and a half, the drivers deserved my support. Which I was happy to see the amount of fans who braved it out in absolutely horrible conditions; as I actually pulled out my pathetic rain gear for the first time in umpteen years! Noting that the last time I’d had rain gear on at PIR was with Randal the Moniker King when I just utilized the rain coat with Randal draping a plastic bag over our legs and holding a very large umbrella - so I probably hadn’t had the rain pants on in I dunno, ten years? After five hours in constant rain, I left for the shelter of my dry hotel room across the freeway adjacent to the track - as I can still vividly remember being so cold from sitting on the aluminum bleachers that my teeth would NOT quit chattering as I walked towards the exit of the track, across the freeway and all the way up into my hotel room; BURR-RRRRR, CRIKEYS! By the way, did I mention what a miserable yucky WET day it was? As the RAIN would pelt us, then let-up before deluging us again! As it never, ever rains in Portland, right? After having watched the Hydrofest, I noted to self how I was freezing on the way home; Err Hotel, albeit noting I was ready to go home - with standing water everywhere, as PIR seems too cheap to pave the pedestrian pathway into the Support Paddock/Vendor Row as I managed to step into every FRILLIN’ puddle along this pathway which had turned into a giant FREAKIN’ mudbog; URGH! Hmm? Perhaps the new Lake Portland? Although I can only imagine what the driving conditions on the race course were like, eh? As did I mention the rain yet? As my raingear was so cheesy that I recall making the mistake at one point to turn and watch some of the Hydroplanes; Err racecars go by and was blessed with feeling a small stream of water immediately run down my chest! As the rain pelted me so hard that it felt literally like rivers of water running down my body with puddles collecting around my wrists, my legs feeling drenched, every time I tried moving my head it would get wet - with constant water driblets cascading off of the hood drawstrings; SHEISA! Randal dropped by my room that evening to retrieve his limited 1st edition No Fenders t-shirt and told me that it was a pretty sad day with approximately 10-20 (Diehard) fans in the stands, which I thought there was a little more, say may be 30-each, albeit I had to admit it was pretty slim pickens. As I said above, Messer Rahal, which I won’t disclose my new moniker for him after kissing-thee-wall at Texas; Hurrah! Let’s just say it’s the bottom part of what you use to make Smores with... Had a pretty eventful day in the rain noting that he’d actually gone off course at lease twice today. The Champ Cars affectionately known as ChumpCarz were then followed by the Atlantics. As I think they were then known as Champ Car presents the Atlantics on Cooper tyres powered by Mazda - BLEEP! Can you make the Frickin’ name any longer, eh? As they’ll always be the Toyota Atlantics to Mwah - as I guess I’m dating myself here? But I digress further. And even way back then my vision was blurry at best which means twenty-seven raging Hornets in the spray appear to be nothing more then just blobs, as the inclement weather made their respective colours fade away to me. Although I did notice one interesting sight; Err noise, as one particular driver was taking the opposite line thru the Festival Curves. Basically taking the outside shoulder of the racing line against the normal inside apex, which I can only surmise he was searching for the day’s elusive grip... Thus whenever he passed by on this outside line closest to me I could actually hear him hitting ALL of the water puddles! Being surprised that nobody actually went off. ‘Whale actually it was reported over the PA System that 5-cars had indeed spun off in the first corner, although they’d made it thru the chicane - nevertheless they pirouetted off exiting the Festival Curves complex; actually the west end of the track as for reasons unknown they’ve mucked up all of the corner numbers... As what used to be Turn-5 to me is now Turn-7, etc, apparently due to the Festival Curves complex which didn’t exist when I first came to the track back in 1987 as a ‘Wee lad. Thus with all of the carnage occurring in the West End complex - my original seats before I got pinched out... A full course caution was thrown which was followed by two laps of the Pace car - as one of the five contestants who’d found the grass was the second placed car, some cat by the last name of Matos... Hmm? Musta-been soon to be IndyCar driver Raphael “Rafa” Matos, eh? As prior to this race Matos had won the first three rounds and was leading the points standings with his spin causing him to drop to mid-pack whilst I’d never heard of him up to this point and he didn’t really make an impression upon me then. 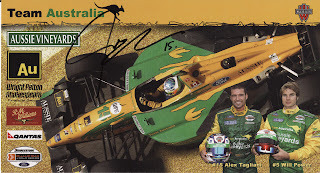 I also noted how another driver of interest to Mwah was Ronnie Bremer now competing in Atlantics after the “Dane had spent the 2005 season as a Champ Car driver for HVM and Dale Coyne, albeit I just recollect him as the driver of the ubiquitous Sonny’s BBQ-mobile... You know, the ‘Juan Justin ‘BIG UNIT Wilson now drives. As I don’t remember where Bremer finished. And then there was Linksheaven’s Boy, as Roy Madden was ultra good to me, not only posting my then just beginning No Fenders website onto his Blogroll but also letting me become a contributing guest writer for what was then the Numero Uno F1 Blogsite at the time - which ‘Mega increased my blogsite’s traffic, as where did Roy go? OOPS! Back to his boy who at the point I don’t think had a driver’s license. You may have heard of him? His name is John Edwards - the race car driver from Arkansas who’d go onto win both the Atlantics and Star Mazda championships before his Open Wheel career sadly stalled! Having defeated a gal by the name “Symona-Symona” (De Silvestro) to that year’s title fight... As Simona’s in the recalcitrant ‘SLOTUS while last I heard John has now become a ‘Tintop pilot in the Grand Am series driving a Mazda RX-8 GT saloon. Whilst another driver who I wanted to keep calling Heathcliffe - you may have heard of him? As he now occupies Danica’s Go Daddy seat in IndyCar... As ‘Kuhnadiun James Hinchcliffe was on Pole position and led almost the entire race until the waning laps when a fresh-faced 18yr old by the name of Wicken? As all I could think of was oh, he’s a witch; Hya! As it turned out to actually be thee Young ‘Wicky, aka Robert Wickens passing James in the closing laps for his debutant Atlantics victory with Hinchcliffe finishing runner-up, as I noted how I DON’T know any of these guys... While thinking the intermission prior to the ‘BigCarz would be painfully long in the rain, but actually wasn’t too bad. Then the weather teased us as the sun came out momentarily, psyche! As the rain not only returned but in gobs, as the Champ Cars went out to basically push water around as I mused how I could actually see the cars individual roostertails, with the track announcer claiming said roostertails were 15-20 feet high; Aye Karumba! As this should give some indication of how much standing water was on track, eh? Curiously I noted that the officials must have waived the 15-lap limit which was the maximum laps allowed during qualifying sessions, as I swear the entire field simply pounded round ‘N round pumping hundreds of gallons of water skywards while futily trying to create a dry line on the racing circuit. To GO Gommendy! Saying he must be the most pleasant surprise to JV & Co. Noting that I believed he was actually outpacing his teammate Neal Jani - although the announcer stated that the PKV Boyz had been running P3-4 at the beginning of the session. Having exited Stage Left immediately after the final qualifying session to go get dry ‘N warm, along with having gotten some much needed nourishment, I found it funny to be able to hear racing cars for a further hour (5-6PM) from my room, which is amazing since I’m across the freeway and my hotel room is directly next to the building’s elevator - which makes it extremely easy to locate. Yet I’m amazed with all of the ambient traffic noise I can hear the racecars - which I’m guessing may be the Atlantics? Watched the local Channel-8 news which showed how absolutely abysmal the day’s outing was - showed the Alex Figge 360-degree spin I’d witnessed at the chicane. But hey, not only did they show PT going off track but Sebastain Bourdais as well - which means you know it was wet! With Doornbos’s runner-up starting spot being a lap time of 1:12+ which was a full 14-seconds SLOWER than Wilson’s Pole winning lap in the dry the day prior; which emphasizes just how much difference the rain made, while Wilson played it safe and was third quick upon the day. Caught the lineup which was Wilson & Doornbos on Row-1. Third was Bourdais - BOOOOOOOOO!!! ‘TAG (Alex Tagliani) was fourth, with Will Power fifth, Rahal P8 and Tracy was 13th. They interviewed Wilson who said it was pretty wild in his typical understated British wit. Noting how there was ZERO visibility! Claiming that when he’d try going a little offline down the front straight to gain some much needed visibility he’d immediately be in the puddles and begin aquaplaning; YIKES! And this coming from a BLOODY ‘BRIT used to driving in the RAIN; pretty crazy! Thus, like I said, we had an Unser and Andretti on hand, albeit not racing - with Johnny representing Cooper tyres while Mario, a staunch ‘Flinstone (Firestone) supporter was in the Manufacturers Midway signing autographs at 3PM, like he did last year. As I’m not sure - Oh wait! Its Champ Cars, never mind; Hya! As I’m certain Mario enjoyed the rain, eh? Yet the part I found totally disgusting - which drove me absolutely Bonkers, having NEVER EVER heard I-T in my life was Johnny Unser’s command to start engines by saying: Drivers start your Mazduh engines for the Atlantics race; SHEISA! C’mon! Can’t we even leave that time honoured phrase out of the dubious grasp of the almighty dollar; Err Capitalism? When Randall knocked upon my door and entered around 4PM, he said; where are your sheets? I dunno, having just returned and trying to change into something dry, I hadn’t noticed the lack of bed sheets and pillows upon the chair as apparently Housecleaning had taken them away? And then after returning from my much needed meal and turning the radio on; Surprise! As the maids had turned the volume way up to some ‘Funkmaster Five CRAP! Before I tuned in “Scare America,” as Jefford calls it to listen to the massive protesting of the G-8 summit where our great leader Georgie Porgy Puddin’ Pie H.W. Bush had gotten sick wherever; Hoorah!